A spaceship lands in Washington, D.C., capturing the attention of the world. But the alien emissary (Michael Rennie) it brings refuses to reveal his mission to any single government, leaving the military, the politicians, and millions of ordinary people to wait in fear. Soon their distrust turns to calls for violence. But one young woman and her son (Patricia Neal, Billy Gray) befriend him...and soon realize that they may be all that stands between the human race and total destruction. Back in the Seventies, an album came out from a mysterious band called Klaatu. They produced one album that didn’t make much of an impact except as a source of semi-controversy. I never heard the record, but apparently the band sounded an awful lot like the Beatles. Given the total secrecy behind the group – who apparently presented no pictures of themselves or had real credits listed at the time – many believed that the Fabs had reunited and put out a new album under a pseudonym. The theory that the Beatles had anything to do with Klaatu soon got debunked, and the group remains an odd footnote to history. What does this have to do with The Day the Earth Stood Still? Klaatu is a character from the film, but otherwise there’s no connection. But how often do I get the chance to display my knowledge of obscure Beatle-related trivia? As for Earth itself, it influenced science fiction as a whole, and it also pops up frequently in pop culture references. Heck, Return of the Jedi even included minor characters named Klaatu, Barada and Nikto. 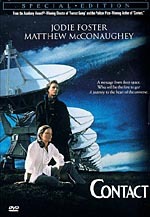 Despite all that, I never saw Earth until it came out as a DVD via the “Fox Studio Classics” collection. 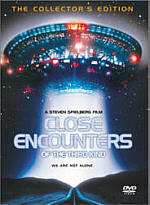 At the start of the film, we watch as people discover a UFO that speeds around the Earth at 4000 miles per hour. Eventually it comes to reside on a ballfield near the Washington Monument. The troops mobilize to surround it, and after a few hours, the door opens and a spaceman named Klaatu (Michael Rennie) emerges. He delivers a message of peace and goodwill, but a trigger-happy soldier blasts him after Klaatu brings out some doohickey. From there a huge robot named Gort (Lock Martin) comes out to defend the territory. The authorities rush Klaatu to the hospital, and while he quickly recovers, he meets with an assistant to the president named Mr. Harley (Frank Conroy). Klaatu demands to deliver his message to all the representatives of the Earth governments, but political opposition makes this difficult. Klaatu wants to go out and meet with ordinary people, but the government refuses to let him leave. Klaatu escapes, and this causes a public panic as people worry that he’ll do something horrible. Of course, he just wants to mingle, and he adopts the personality of a guy named Carpenter. Klaatu seems bemused as he witnesses the unnecessarily panicked reactions to his arrival on Earth. Eventually he rents a room at a boarding house, and there he connects with Helen Benson (Patricia Neal), the widowed mother of Bobby (Billy Gray). Among others, we also meet Helen’s boyfriend Tom Stevens (Hugh Marlowe). The group befriends Klaatu/Carpenter, who spends an entire day seeing the sights with Billy. When Klaatu wants to meet the smartest person possible, Billy leads him to a scientist named Professor Barnhardt (Sam Jaffe). The doctor’s out, but Klaatu leaves a message via a solution to a complex math equation. Eventually a government agent takes Klaatu to meet with the Professor, and the alien reveals his identity. If the Professor can arrange it, he agrees to speak to a panel of scientists. All of this leads to events related to Klaatu’s attempts to deliver his message and deal with the humans. Though it usually gets classified within that genre, I didn’t really see The Day the Earth Stood Still as a typical science fiction movie. Those elements really only popped up sporadically during the flick, mostly when Klaatu demonstrated his powers or we saw the actions of Gort. Otherwise, the film largely dealt with the way people react to the unfamiliar. Set during the period when Americans displayed a tremendous fear of Communism, the underlying influence involved seems pretty clear. I didn’t see Klaatu as a representation of Communists, as I definitely didn’t think the filmmakers wanted to convince us that Communists are as benign and thoughtful as the alien. However, Klaatu came to represent the irrational fear of the unknown. People reacted to his presence based on their own biases and didn’t deal with what they got. As noted, the bemused Klaatu reacts to all of the imagined terror he supposedly will cause. Earth helps demonstrate that we don’t necessarily need to fear the unfamiliar. Director Robert Wise bathes the proceedings in an atmosphere of paranoia and fear that allows these points to expand. Though Klaatu does represent something of a threat, it’s not a direct one at the current time. Yes, he warns Earth people that they need to clean up their act. He represents aliens who worry that rockets armed with nukes will eventually wreak havoc on their own societies, so Klaatu threatens Earthlings. He relates that if they don’t back down from their potential attempts at nuclear annihilation, the aliens will destroy the planet to protect themselves. While this fact makes it sound like Klaatu’s pretty hostile, all the panic evidenced by humans has nothing to do with his warnings. They don’t know about his message, and they react simply based on ignorant fear. The movie does make the point that we shouldn’t be afraid of the unfamiliar just because of our lack of knowledge, but it comes across as a bit preachy and illogical at times. Some of the steps taken by fearful humans go too far, but it’s absolutely natural to freak out a bit when something or someone as unusual as an alien arrives on Earth. That seems especially true since it’s obvious anyone/thing that can zoom across space clearly possesses technology superior to ours, so we’d potentially have a lot to lose in such an encounter. Not that you’ll find much explicit menace in Klaatu – at least not until he threatens to destroy us all if we don’t police ourselves better. The filmmakers lucked into a real find with Rennie, who seems absolutely perfect as Klaatu. He’s just handsome enough to fall into the leading man territory occasionally required of him here, but he also looks fairly offbeat, which gives him something of an alien appearance. Though Klaatu occasionally comes across as more smug and condescending than I’d like, Rennie delivers a nicely distant tone for the part that makes him eminently believable as an alien. Overall, The Day the Earth Stood Still holds up as a contemplative and compelling entry in the science fiction canon, even if I think its sci-fi elements remain fairly incidental. The flick comes across as a little preachy at times, but it also seems thought provoking and intriguing. Some parts of it haven’t aged tremendously well, but for the most part, it works nicely. The Day the Earth Stood Still appears in an aspect ratio of 1.33:1 on this double-sided, single-layered DVD; due to those dimensions, the image has not been enhanced for 16X9 televisions. A mix of concerns left this as a mediocre transfer. Sharpness appeared erratic. The movie often looked fine, but more than a few shots exhibited moderate softness. Jagged edges and moiré effects created no problems, but edge enhancement showed up too frequently. I noticed more than a few examples of haloes around objects, and these occasionally became a distraction. Black levels seemed solid. The movie maintained good contrast and depth, as dark tones appeared nicely deep and rich. Shadow detail also appeared smooth and neatly delineated. Print flaws caused some concerns. I noticed examples of specks and grit as well as a few scratches, marks and blotches. Grain seemed a little heavy at times, but most of those issues stemmed from special effects shots. Overall, this was an acceptable transfer but not a particularly good one. As with the other releases in the Fox Studio Classics line, Earth included both stereo and monaural soundtracks. Like others such as Gentleman’s Agreement, the stereo mix for Earth stunk. The track displayed a terrible sense of definition across the front channels. It just demonstrated a big spatial blob with no distinctive delineation or placement. Speech spread across the front channels, which made the lines mushy. Overall, the soundfield came across as nothing more than mucked-up mono, and the track seemed like a bad distraction. Audio quality for the stereo mix fared a little better but still showed problems. Speech tended to sound rough and edgy, though the lines generally appeared intelligible. Effects were reasonably accurate, though they became a bit shrill at times. Music demonstrated decent clarity but appeared too bass-heavy, as the mix sounded fairly dense and boomy. As a whole, the stereo track for Earth flopped badly. Happily, the monaural mix appeared significantly more satisfying. Speech came across as much clearer and more natural, and I noticed few of the issues related to edginess. The lines remained distinct and intelligible. Some of the louder music became slightly shrill, but those elements generally appeared bright and reasonably lively. Effects also came across as fairly clear and lacked most of the harshness I heard on the stereo track. The mono mix also featured very little noise. The mono version of Earth presented much greater definition than the stereo one, and it seemed like the soundtrack to use. Earth includes a very nice package of extras, many of which came from a 1995 laserdisc release of the film. On Side One, we start with an audio commentary from director Robert Wise and filmmaker Nicholas Meyer (Star Trek II: The Wrath of Khan, Time After Time). Both were recorded together for this running, occasionally screen-specific track. For the most part, Meyer acts as interviewer, especially during the film’s first half. Wise discusses some specifics of Earth such as casting, story issues, and other topics, but he often talks about his general filmmaking thoughts. He tells us how he likes to work, and while this often touches upon Earth, Wise frequently digresses into other films. Meyer becomes more active in non-interviewing ways as the track progresses, and that gets a little annoying. He tends to interject himself a bit too frequently. While it’s somewhat interesting to hear his negative opinions of Hugh Marlowe’s acting, he dwells on the topics too much, and he also reminds us of his own The Day After and other topics too often. The commentary peters out a bit during its second half, as more silent spots occur and the pair occasionally have to stretch to find something to say. A couple other bits round out Side One. Movietone News provides a six-minute and 19-second clip from 1951. In addition to a little coverage of the movie, we get snippets about other news events like a Japanese peace treaty. It’s a brief but neat look at contemporary history from the time of Earth’s creation. After the film’s theatrical trailer, Side One ends with the THX Optimizer. It purports to help you set up your home theater to best present the movie on the disc in question. Apparently the Optimizer is unique for each DVD on which it’s included; unlike programs such as Video Essentials, the Optimizer should tweak your set-up differently every time. Frankly, I’ve been very happy with my already-established calibration and I’m afraid to muck with it, so I’ve never tried the Optimizer. If you lack calibration from Video Essentials or a similar program, or if you’re just more adventurous than I, the Optimizer could be a helpful addition. As we move to Side Two of the DVD, we find a few more pieces. We start with Making the Earth Stand Still, an 80-minute and 37-second documentary also from the 1995 laserdisc. It includes remarks from director Wise, producer Julian Blaustein, actors Patricia Neal and Billy Gray, contemporary director Joe Dante (Gremlins, Innerspace), Bernard Herrmann biographer Steven C. Smith, and memorabilia collectors Bob Burns, Marc Zubatkin, and William Malone. The program also includes some archival materials and clips from the film. Though “Making” suffers somewhat from its very dry presentation, it does present a lot of good information. The participants cover the film’s route to the screen and we hear some comparisons between the flick and the original short story. We learn about the script’s development and Wise’s desire to make the piece as realistic as possible. Then we move to casting and get some stories from the set as well as technical details, the relationship between the film and the political climate in which it was made, its legacy, and a number of other topics. Again, the bland manner in which we see the material makes the show move somewhat slowly, but I can’t complain about the quality of the information. “Making” provides a detailed and even-handed discussion of Earth. The Still Galleries domain breaks down into six smaller areas. Most of these present pictures. We get sections devoted to “Production” (60 shots), “Scene and Set Photos” (129 images), “Construction Blueprints for the Ship” (21 frames), “American and British Pressbooks” (107 screens), and “Posters, Lobby Cards, Spaceship Model and Gort” (62 stills). A lot of these seem like fun, and I especially like the pressbooks. The “Still Galleries” also include the film’s “Shooting Script”, displayed as a stillframe piece. This should be very interesting for fans of the flick. Earth ends with trailers for One Million Years BC and Journey to the Center of the Earth plus a Restoration Comparison. 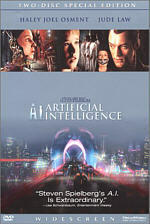 This three-minute and 56-second piece provides text that covers the work done for this DVD and then shows splitscreen images of a mix of different versions of the film. 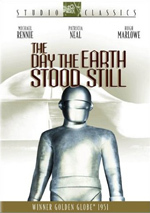 One of the most influential science fiction films ever created, The Day the Earth Stood Still continues to hold up well after more than half a century. It shows artifacts of the era in which it was created, but its message remains timely, and the movie seems lively and compelling. The DVD presents average picture quality plus a fine monaural soundtrack; stay away from the miserable stereo version, however. In addition, we get a pretty solid roster of supplements that help detail the production. With a list price of less than $20, Earth definitely earns my recommendation.